This was my thought mostly because mine is a struggle. 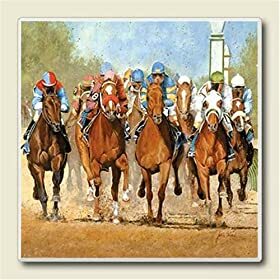 as a guy who lives in and around the Louisville area, the Kentucky Derby should be it, I guess, but in reality for me it is The Masters. I enjoy the sounds(Birds and whatnot), the green green landscape, and Jim Nantz and Nick Faldo talking it up. I never miss it. I love the NBA All-Star game, and the whole of NBA All-Star Weekend really. If I was rich I would go to every event all weekend every year. Opening day of the baseball season. Even if I'm not really enthused about the season to come, there is something wonderful about getting through the winter and finally seeing that lovely baseball field all green and bright. The deciding game of the Stanley Cup Finals. No bigger trophy presentation in sports. Each guy gets to hold it and skate with it, then the team pic with it, on the ice. Just beautiful. I would agree with that but I would probably say for once a year Thanksgiving Thursday NFL. Can't really say why except for childhood memories. The Stanley Cup Playoffs. I can't follow hockey at all during the regular season, but I'll sit in front of my TV for hours on end. Heck, I even know where CNBC and the NHL Network are on my cable system for the duration of the playoffs. Super Bowl...unless it's an Olympic year. Interesting question for me. I would say that when the Rangers are in the Stanley Cup finals, that's bigger than anything for me. However, when my teams aren't involved, I'm usually more invested in the World Series than the Stanley Cup finals. Also, in recent years I'm usually in Singapore during the Stanley Cup finals (and also for the Super Bowl), so I usually don't make the effort to watch if it isn't my team. If it counts, then probably the right answer for me is the World Series of Poker main event final table. That's something I'll really get pumped up for no matter who's involved. As someone else who lives in and around the Louisville area the Derby is certainly up there but for me it's the 1st weekend of March Madness. I usually take off that Thursday and Friday every year so I can do nothing but watch basketball from Noon Thursday to midnight-ish or so Sunday night. The Daytona 500. Go figure, I like NASCAR but it's only third on my list after baseball & football. But there's something about the pomp and circumstance of it, it's sort of like the Super Bowl but without too much non-sport related stuff clogging the telecast once it starts. I also think the timing of it is significant in that I feel it's a turning point in the sports year. The dog days of winter are starting to end, college basketball, NBA, and NHL games start actually meaning something after this, and baseball is just around the corner. It just feels like a breath of fresh air. Now if you asked me my favorite sporting *day*, I would say Memorial Weekend Sunday. F1 at Monaco, the Indy 500, the Coca-Cola 600, it's a auto racing fan's dream. Plus you add baseball in full swing and a NHL and/or NBA playoff game or two and you got a really full slate of sports to watch all day and night. I like the running of the bulls only to watch idiots get trampled. First round of NCAA March Madness. I love taking Thursday and Friday off from work and trying to follow every game with my buds. And after going to Vegas for the opening round a few years back? Best annual event by far. The Open Championship. I love watching live golf first thing in the morning. Every year my friends and I rotate on who has breakfast and mimosas at their house while watching the tournament. The Kentucky Derby, followed closely by The Breeders' Cup. Obviously a large part of that is being a fan of the sport of kings; but the main reason why I look forward to those events is that a group of close friends use those dates as semi-annual get-togethers; reunions of a sort. So it's really not so much the events themselves as it is getting to see some old buddies once again. The Winter Classic hockey game. They go all out and pack a stadium, and I love watching people play sports in snow. Pages: 1 Thread ahead: What's your board game? Next thread: What's your favorite ARCADE video game? The W - One Question... - What is your favorite (non Wrestling) Once a year sporting event Register and log in to post!